James Johnston, 84 of Smithville, MO passed away, April 6, 2019 at his home. He was born on April 16, 1934 to Stanley “Red” and Louise (Dinkle) Johnston in Smithville, MO. Jim grew up in Smithville and graduated from Smithville High School. He then served his country in the U.S. Army during the Korean War. On March 24, 1956 he was united in marriage to Roberta Lee Thomas. After their marriage they lived in Smithville where they made their home. Jim worked at Kansas City Power and Light for 36 years, and also operated an American Family Insurance Agency in Smithville for 36 years. 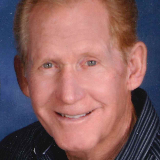 Jim was a member of the Smithville First Christian Church where he served as a Deacon. He was also a member of the Smithville American Legion. He was an avid pool player, enjoyed horses, country western music, and dancing. Most of all, Jim loved spending time with his grandchildren. Jim was preceded in death by his parents, infant son, Kevin James Johnston; and sisters, Fern Titus and Peggy Carpenter. He is survived by his wife, Roberta, of the home; daughter, Malinda (Robert) Pierce; son, Jeff Johnston and wife Lisa; grandchildren, Matthew Pierce, Bethany Pierce, Megan (Walt) Steimel, and James (Megan) Johnston; one great-grandson on the way; and honorary daughter, Laura Justus Irvine; brother, Dennis (Carol) Johnston; brothers in law and sisters in law, Lois (Vince) Sopher, Sydney Croxdale, and Terry (Mary) Thomas; several nieces and nephews, other relatives and many friends. Funeral Services: 10:00 a.m. Wednesday, April 10that the Smithville First Christian Church in Smithville. Visitation: 6:00-8:00 p.m. Tuesday at the church. Donations may be made to the church.